Yep, it’s possible to do a smokey eye in one step… with one product! All you need is a cream stick shadow in a deep shade. I’ve written about it before using Laura Mercier’s Caviar Sticks, but I just stumbled onto Jouer Creme Eyeshadow Crayon ($24) and I’m totally smitten. 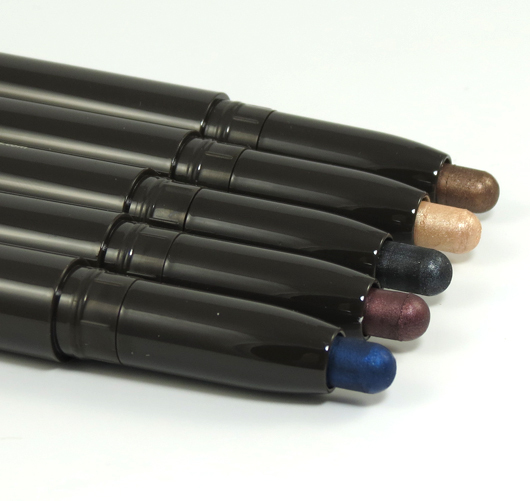 The crayons come in nine shades (four are new to the range), but I’m especially keen on the look of the one step, 20-second smokey eye created by Venetian, a dark moss hue, Baroque, a full-bodied bronze, and Abstract, a deep slate. Here’s how it works: Close your eye and draw a line in the crease from the outer corner to midway in. Take your finger and blend down toward the lash line. Repeat on the other eye. Within 20 quick seconds you have a simple, light and carefree smokey eye. If I’m going out at night I’ll add a bit of the same color to my lower lash line and smudge out for the full smokey eye effect. If you want to add more drama, use a pop color, like Rocco, a shimmering eggshell, to create dimension. Dab this lighter shade in the center of your eyelid and blend inward, toward the inner corner. You can even add a bit on the brow bone for additional highlighting. And that’s it! Could it be any simpler?